Background: Breast cancer is the most common invasive cancer in female worldwide. Indole scaffold represents an important class of therapeutic agents in medicinal chemistry. Many indole derivatives are reported as potent anticancer agents. This study aims to design, and synthesize anti-breast cancer potential of new bisindole derivatives. Method: The target molecules were prepared by reacting cyano acetyl indoles with substituted indole-3- carboxyaldehydes in the presence of piperidine. All the newly synthesized compounds were in vitro screened for their anticancer activities against breast carcinoma (MCF-7) by employing the sulforhodamine B (SRB) assay method. Results: Preliminary in vitro evaluation indicated that most of the compounds possess distinct cytotoxicity profile against MCF-7 cell line compared to standard drug adriamycin. 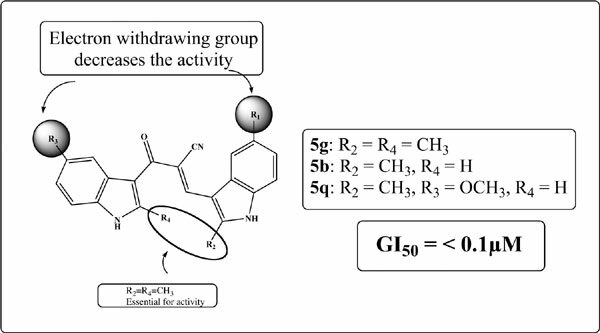 Among them, compounds 5g, 5b, and 5q demonstrated excellent activities against breast carcinoma (GI50 < 0.1µM) as good as adriamycin (GI50 < 0.1µM). Active compounds were further subjected for molecular docking and bioavailability studies. These studies supported activities of the present series compounds. Conclusion: New anti-breast cancer agents are the need of time, we believe that the new α-cyano substituted 1,3-bisindolyl-2-propen-1-one derivative 5g reported in this work may provide an interesting insight for further optimization. Keywords: 1, 3-Bisindolyl-2-propen-1-one, Knoevenagel condensation, breast carcinoma, MCF-7, molecular docking, bioavailability. Keywords:1, 3-Bisindolyl-2-propen-1-one, Knoevenagel condensation, breast carcinoma, MCF-7, molecular docking, bioavailability. Abstract:Background: Breast cancer is the most common invasive cancer in female worldwide. Indole scaffold represents an important class of therapeutic agents in medicinal chemistry. Many indole derivatives are reported as potent anticancer agents. This study aims to design, and synthesize anti-breast cancer potential of new bisindole derivatives. Natural Products as Promising Antitumoral Agents in Breast Cancer: Mechanisms of Action and Molecular Targets.